If you want to send money transfer to and from any country, Western Union rates are an important consideration to know and think about. This data is taken from the official WU website from the United States. Because you cannot find any information from the official website which reveals the charges depending on how much cash you want to send or is looking forward to receive respective of the fees to collect by the nearest branch of authorized outlet agent in a store, it is hard to come up with and prepare the money in advance. In this case, you will have to visit a provider and ask over the counter or from an authorized teller agent for a copy of the table of charges bracket. Since it is always hard coming not prepared, we have listed the different nearest Western Union branches in Metro Manila and surrounding provinces. On the other hand, with a large list and constantly changing currency exchange values, these rates are prone to changes up and down as per our family's experience of receiving money from abroad so in aid of helping solve this problem, you can keep updated with the latest and new rates of Western Union (WU) Money Transfer pera padala through this page we have for this year 2014. We promise to keep you updated each year in the coming 2015 onwards. 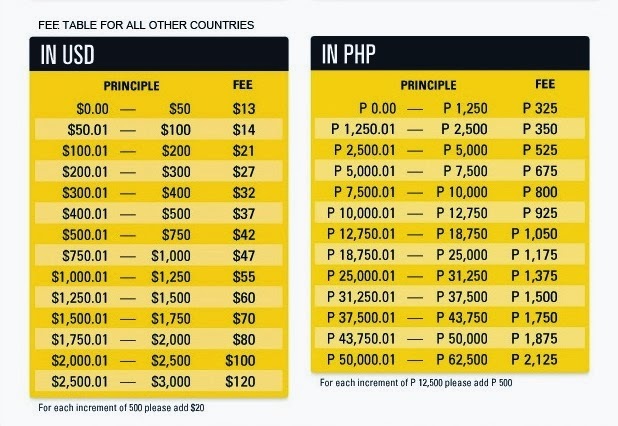 We will be updating this table from time to time so to keep updated with the latest charges if you want to send money abroad or receive one here in the Philippines, please bookmark this page or save it in a notepad. We have the peso and dollar rates table so you can compare and see how much you are spending when an OFW, migrant worker or resident outside of the Philippines will send money to you or if you are the one sending money abroad. In case you didn't know it, there are many Filipinos receiving money transfer from the U.S. or Ireland via Western Union today as online publishers of Google Adsense. It has become part of the online business in the Philippines. We use this same table to compare rates. As a tip for those who are receiving the same if your earnings were paid on that date, it will be the rate exchange value of your dollar earnings if you want to receive in dollar currency. So the tip is, if you want a higher exchange rate, do compare the latest currency exchange rate with that of the rate that Google sent you the money. This way, you will extend a bit of amount to your money transfer. Although Google pays Western Union rates, I'm not so sure if it will be deducted under your payment. We have listed the different branches, their office location address and respective hotline telephone numbers of WU for your information so you know where is the nearest authorized agent. What to Bring When Receiving Money via Western Union? At least 2 valid primary IDs or government issued IDs when recieving money. It is highly suggested to use passport / driver's license / UMID / SSS ID / GSIS ID / Pag-Ibig ID etc. 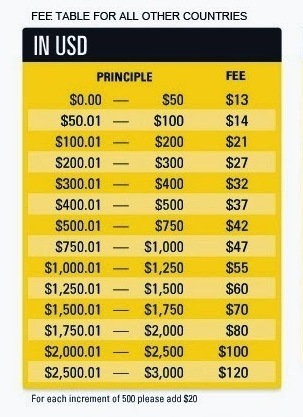 Note that Western Union rates listed on the table of charges above are subject to change any time without prior notice to the public so be sure to always call their hotline telephone numbers first or ask first how much is the day's currency exchange rate. If by any chance you fail to receive your money transfer. At whatever cost, do not leave your MTCN or money transfer control number to the teller for security reasons. I know a few friends who got robbed out from their earnings but I will not disclose here what particular money transfer company it happened. 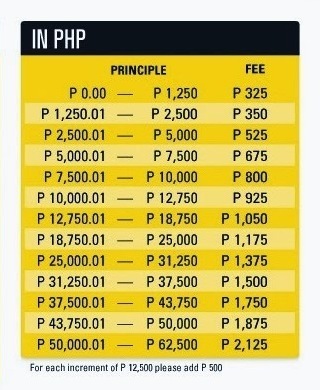 Back then, we have Western Union rates ranging up to Php 54.00=$1.00 and they lost more than $6k. If this can be done is big amounts like that for whatever purpose or reason, it may also happen in small deviations so please be extra careful on this - ALWAYS.